In v. 51, Jesus takes his interpretation of the verb “to eat” one step further. He begins by repeating his self-identification as the bread from heaven (v. 51a). 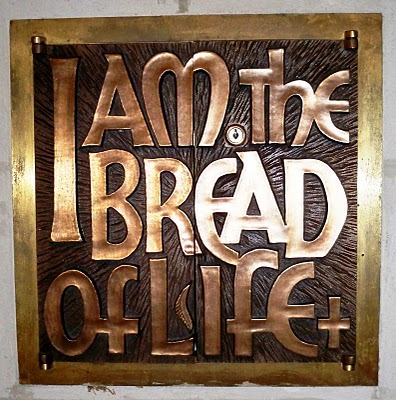 “Living bread” (a synonym for “bread of life”), like the “living water” of 4:10–14, is life-giving. To underscore this, Jesus then repeats that eating this bread will give eternal life (v. 51b; cf. v. 50). He concludes his words with a dramatic twist, however: “The bread that I will give for the life of the world is my flesh” (v. 51c). What does it mean for Jesus to speak of the gift of his flesh for the life of the world? First, the language at the end of v.51 recalls both 1:14 (“and the Word became flesh”) and 3:16 (“God so loved the world that he gave his only Son”). Verse 51 thus evokes the incarnation, the gift of Jesus’ life out of God’s love for the world. Second, it is possible to see an allusion to Jesus’ death in the language of v. 51c: Jesus will give up his life, his flesh, as an expression of the same love manifest in the incarnation (10:17–19; 15:13). Finally, any Christian reader of v. 51, from the Fourth Gospel’s first audience to the contemporary church, would hear eucharistic connotations in these words. The eucharistic imagery is not yet fully explicit (that will occur in vv. 52–58), but the direction of the imagery for the Christian reader is clear. John 6:47 Amen, Amen, I say to you: Moloney, a Johannine expert, says that John’s use of this expression is generally not stating “what follows is true, so pay attention,” but is used to link what came before with what follows. He offers a more contextual translation as “because this is the case.” Most scholars translate it literally. John 6:49 your ancestors: This a change in Jesus’ language from v.31 when he spoke of “our ancestors.” It might point to one of several instances (8:17 and 8:56) when “your Law” and “your father Abraham” may well point to the later deep division between the synagogue and the church. John 6:51 the bread that I will give for the life of the world is my flesh: Many of the words in this verse (ho artos, sarx, ego doso, hyper) reflect the celebration of the Eucharist and serve as an introduction to vv.51-58, considered the core of John’s Eucharistic theology.